The ‘charter boat’ article appeared in issue 461 of ‘Sea Angler’ magazine published in December 2010. The article features John fishing the North Pembrokeshire coastline in search of bass, pollack and wrasse over inshore reefs and headlands. This is an individual style of charter with just one person fishing from the boat guided by John. ‘Hubble,bubble,toil and trouble’ was published in ‘Sea Angler’ magazine during 2010 featuring John float fishing live sand eel for bass from a local Gower location. ‘Easy Rider’ (2010) was showing your host John George fishing a local shore mark for Bass using lures,fly and live bait. 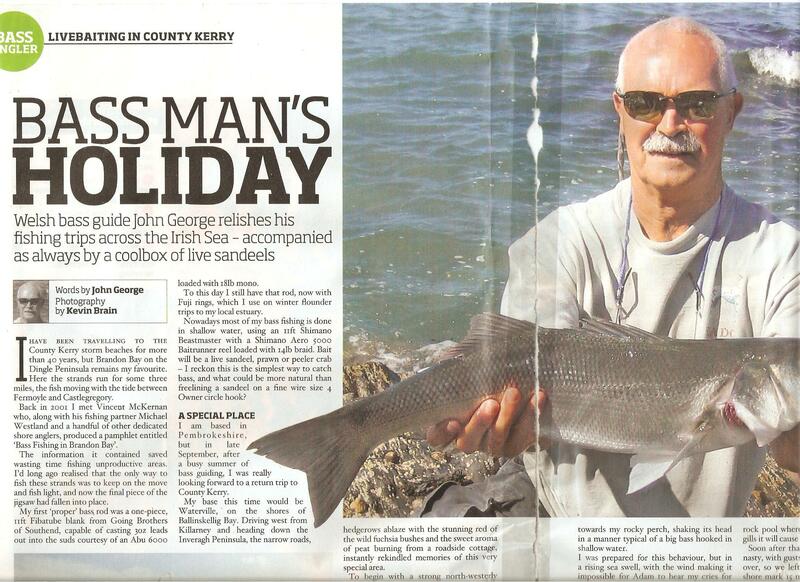 ‘Bass man’s holiday’ was in issue 509 of Sea Angler, relating to John’s fishing trip to Ireland in the Autumn of 2014. ‘Float fishing live sand eel for bass’ was published by ‘An Irish Anglers Digest’ in October 2015 when John joined the magazine’s writer Ashley Hayden on a visit to the South East coast of Ireland in search of Autumn bass.